The NIH's Biomedical Research Task Force recently released a report that includes recommendations for how to change graduate and postdoctoral training in order to "support a future sustainable biomedical infrastructure." As a current postdoc living in the biomedical career trenches, I found this report fascinating and a lot of food for thought. Increase training for various career options outside of academic research. Increase the number of grad student and postdoc training grants and fellowships while decreasing the number of trainees supported by research grants. Cap the number of years a grad student can be supported by the NIH (in any capacity) at six (institutional average of five). Review the career outcomes of all biomedical PhDs (not just those on training grants); train study sections to value a wider range of career options. Increase postdoc pay (especially for advanced stage postdocs) and require all NIH-funded postdocs to receive benefits equivalent to other employees. Encourage shortening postdoc training by increasing the number of "skip-the-postdoc" and K99 grants (and shortening the eligibility for K99s to three years after PhD). Make the 'staff scientist' career path more viable by encouraging funding of grants that include these positions. Decrease the percentage of NIH funds that can be used to pay faculty salaries (with the goal of having institutions increase salary support). Collect better information about the number of trainees and their career outcomes; create a permanent unit that collects these data and continually monitors the workforce. I was surprised by the lack of data the task force had to work with (as were the committee members). For example, there is evidently no mechanism currently in place to track the total number of NIH-funded postdocs. But the graphs that are included in the report are pretty dramatic. 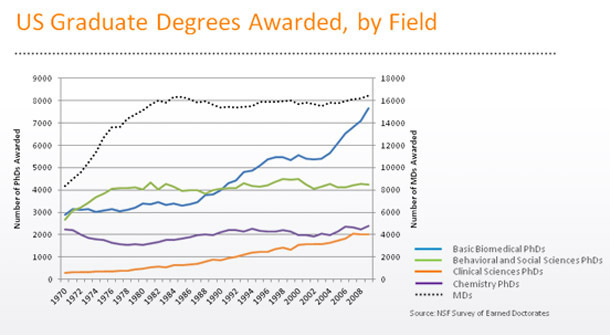 The graph showing the large increase in the number of biomedical PhDs from the 1970s until 2008 looks like house prices at the height of the housing bubble. Dr. Sally Rockey, NIH's Deputy Director for Extramural Research, was "quite surprised by the idea that the majority of our trainees do not end up in academia," but I wasn't, and neither was scientist-blogger DrugMonkey. With the increase in trainees shown in these graphs (and no similar increase in the number of faculty positions) it would be impossible for most of the trainees not to end up outside of academia (or in long postdoc positions). This is one reason why I think increasing the number of staff scientist positions—and making this a more viable career path—is a good recommendation. Dr. Jennifer Rohn eloquently presented the case last year. Decreasing the years a scientist spends in training will not have much of an impact if there isn't a job waiting for them on the other side, and increasing the number of staff scientist positions is one way to combat this (as is training for other career paths, another welcome addition). I have several colleagues who would love to have this type of position (lab heads love them too because they provide institutional knowledge that can be lost when a lab is filled with temporary trainees). The challenge will be finding a way to fund these positions that is not entirely based on grant money as that would make these positions less stable. In fact, and not surprisingly, the challenge for implementing most of these recommendations is finding the money. The money for increasing the number of training grants and fellowships and raising postdoc pay will have to come from somewhere, and given the NIH's current tight budget it is unclear where this will be. Perhaps this is why many of these recommendations were made by previous committees and never implemented. For example, the NIH recommended raising NIH-funded postdoc starting salaries to $45,000 in 2001 (they are now $39,264). It appears to me that the committee is suggesting shifting some of the burden of these costs to institutions (for faculty and staff scientist salaries, for instance), but the NIH has limited power to enforce those suggestions. But as they say "knowledge is power" and this report is a good first step in that direction. Given all the press the overproduction of PhDs has gotten recently, I have a feeling that the NIH may feel more pressure to find ways to implement these changes. I will be curious to see.